Led by the inventor of the lithium-ion battery, a team of researchers in the Cockrell School of Engineering at The University of Texas at Austin has identified a new safe and sustainable cathode material for low-cost sodium-ion batteries. During the past five years, sodium-ion batteries have emerged as a promising new type of rechargeable battery and an alternative to lithium-ion batteries because sodium, better known as the main element of salt, is abundant and inexpensive. In contrast, lithium-ion batteries are limited by high production costs and availability of lithium. If researchers can figure out how to improve the performance and safety of sodium-ion batteries enough to widely commercialize them, then they could one day be used for wind and solar energy storage and to power electric vehicles. 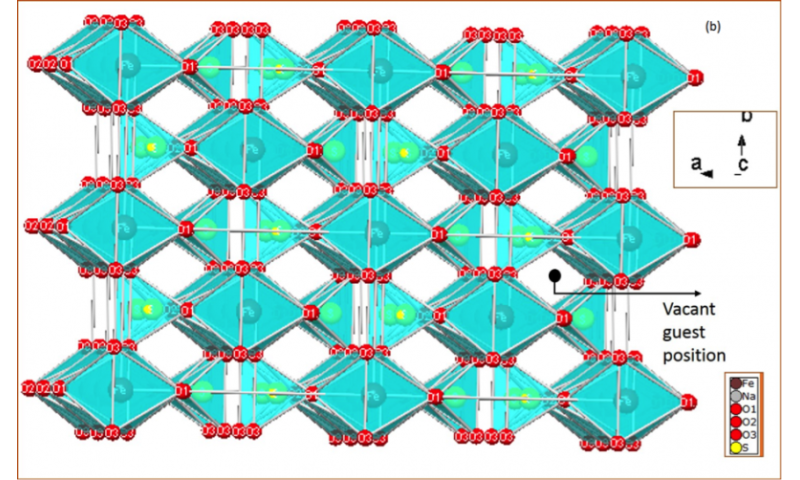 To that end, professor John Goodenough, the inventor of the lithium-ion battery, and his team have identified a new cathode material made of the nontoxic and inexpensive mineral eldfellite, presenting a significant advancement in the race to develop a commercially viable sodium-ion battery. The researchers reported their findings Aug. 27 in the journal Energy & Environmental Science. "At the core of this discovery is a basic structure for the material that we hope will encourage researchers to come up with better materials for the further development of sodium-ion batteries," said Preetam Singh, a postdoctoral fellow and researcher in Goodenough's lab. Sodium-ion batteries work just like lithium-ion batteries. During the discharge, sodium ions travel from the anode to the cathode, while electrons pass to the cathode through an external circuit. The electrons can then be used to perform electrical work. Although sodium-ion batteries hold tremendous potential, there are obstacles to advancing the technology including issues related to performance, weight and instability of materials. The team's proposed cathode material addresses instability. Its structure consists of fixed sodium and iron layers that allow for sodium to be inserted and removed while retaining the integrity of the structure. One challenge the team is currently working through is that their cathode would result in a battery that is less energy dense than today's lithium-ion batteries. The UT Austin cathode achieved a specific capacity (the amount of charge it can accommodate per gram of material) that is only two-thirds of that of the lithium-ion battery. "There are many more possibilities for this material, and we plan to continue our research. " Singh said. "We believe our cathode material provides a good baseline structure for the development of new materials that could eventually make the sodium-ion battery a commercial reality." One challenge the team is currently working through is that their cathode would result in a battery that is less energy dense than today's lithium-ion batteries. Wouldn't really matter for large scale storage. Number of cycles is far more important there. If they have solved this issue then sodium ion batteries are ready for prime time.